The most valuable asset most people ever own is their home. Unfortunately for most people in Warren, this has not proven to be a very good investment. Keep in mind that we are talking about median numbers here, so there are exceptions, but the chart tells the tale. In 1970, the median price of a home in Warren was $16,200. This means that half the houses sold that year cost more, and half cost less. If we adjust the $16,200 for inflation over the following 45 year, that median house should be worth $98,920 today if it had kept up with inflation. Instead, the media home value in 2015 was only $62,900, which is about 36% below the keep-up-with-inflation number. The problem is a pretty simple example of the effects of the law of supply and demand. We lost a third of our population but people don’t take their houses with them when they move, so we have an over supply of houses. And because so many of those houses are vacant, they deteriorate, degrade their neighborhoods, and further depress housing values. The most distressing aspect of this spiral is that it is accelerating. 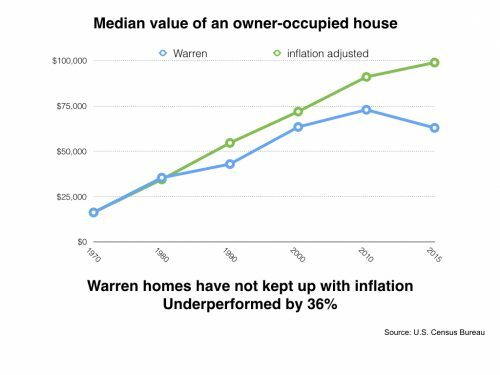 Note that while Warren began to fall behind the inflation curve in the early 1980’s, housing values here did increase for many years; we were just trailing the inflation rate. But things took a dramatic shift for the worse in the most recent Census report, which shows that home values actually decreased by more than 13% since 2010. While the rest of the country was recovering from the recession, Warren’s fortunes, as measured by the value of our real assets, took a significant nose dive. The Census does not tell us the average age of home owners, but I will offer a final observation from my many hours knocking on doors all over the city. I believe the average age of home owners is quite high — probably over 60 years. And who will by their homes when they retire to Florida or pass away? Posted Monday, March 27th, 2017 under Economic development.